Most people around the world—probably including Donald John Trump—were shocked by the outcome of the 2016 general election. We were not. What happened in November was the product of an insurgent candidate in an insurgent campaign led by insurgents. We have been studying, preaching, and practicing insurgent leadership for years. We saw the opportunity—better call it the overwhelming certainty—that an outsider could run and win the presidency. Full disclosure: everybody should have seen it. Hillary Clinton ran her experience-and- the-status-quo value proposition against Obama’s “hope and change” in 2008 and lost, only to try the very same combination against Trump’s “revolt and change” in 2016. Well, if at first you don’t succeed, you might consider try, try, trying something different. The unavoidable truth is that the Information Revolution is well advanced upon us and has increasingly shaped every aspect of our lives. As our sources of information have both broadened and flattened, becoming interactive instead of issued one-way from a few central outlets, insurgents have come increasingly to hold the advantage in political, military, consumer, and corporate campaigns. Insurgent brands disrupt or dominate every marketplace today: political, military, consumer, and corporate. Accordingly, this disruption and dominance have been sweeping politics, marketing, and every form of leadership. 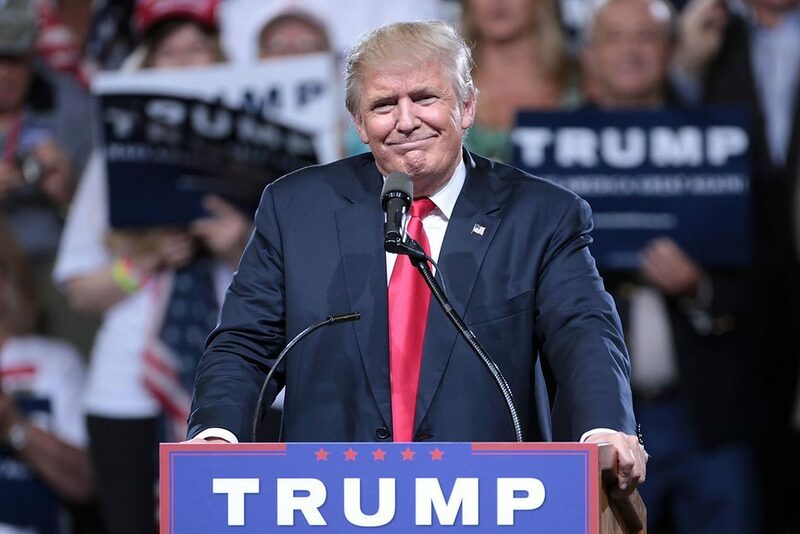 Understanding the insurgent principles Trump used to win will help you understand how to be more successful in our turbulent change environment, whatever organization and markets you operate in. In fact, these principles provide the winning edge in virtually any kind of competition these days. 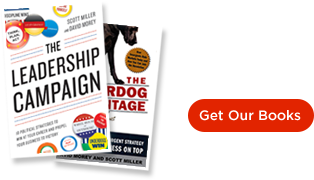 We know because we have spent our professional lives bringing the elements of political campaigning to business leadership and insurgent business-style leadership to political campaigning. We have both advised and learned from successful revolutionaries in politics and business, ranging from Steve Jobs to Corazon Aquino to Bob Iger to Barack Obama to Donald Trump. We’ve found they embrace startlingly similar principles—the insurgent principles that have been overturning the status quo since the Spartans stood against Persia and Pepsi challenged Coke. We ourselves wrote about this subject in The Underdog Advantage (2004) and The Leadership Campaign (2016), but few in our time have applied the principles of insurgent victory so relentlessly as Candidate Trump. 1. Insurgents value speed and mobility over size and scope. Trump was massively outspent from the outset of his bid to win the Republican nomination and then the general election. Although he used very little paid media in his campaign, he controlled the dialogue throughout the long campaign. That this control was held for better or for worse hardly matters. What matters is that Trump held it. His fifteen rivals for the Republican nomination were outsmarted, out-planned, and out-spoken. Maybe you work for a huge, brand-name, incumbent organization. No matter. Marshal your resources as if it were a no-name start-up. Discipline sharpens the mind, while waste dulls it. Make every action and every dollar count. This starts with the very first principle of any insurgent campaign, namely “do the doable.” Take whatever opportunities are handed to you. Low-hanging fruit? Come back to it, but begin instead with the fruit that’s already in the bowl. Focus on building momentum a few yards at a time instead of going for the Hail Mary pass. Never give your team an impossible goal. In fact, don’t even exhort them to “stretch.” These shenanigans just demoralize your side and energize your opposition. Concentrate on getting some first downs. You want magic? Momentum is magical. 2. Insurgents move the movable. Lacking Clinton’s sophisticated Big Data-driven ground game and gazillions of strategists, the Trump campaign nevertheless recognized the votes their candidate needed to move in order to win. Having recognized them, the campaign never forgot them. In the last week of his presidential bid, the candidate flew “Trump Force One” to seven campaign stops a day. The Democrats scoffed, making references to throwing everything against the wall in the hope that something would stick. In fact, the strikes were surgical, geographically widespread, but in terms of the unmet needs of the electorate, tightly bunched. Democrats were outraged when Trump refused to promise that he would accept the results of the election. Hillary Clinton said that was “Horrifying!” In the end, Clinton won the popular vote but lost in the Electoral College and then signed onto the Green Party’s recount initiative in Wisconsin, Michigan, and Pennsylvania. The fact is, both campaigns had been strategically aimed at winning the Electoral College. Trump’s campaign was the one that never forgot this. The most recent of Caddell, Miller, and Perkins’s WeNeedSmith.com polling revealed that 67.6% of voters believe America is on the wrong track, 62.9% believe the American way of life is changing for the worse, and 72.2% believe America is actually in decline. The bottom line? The “old way” versus “radical change” loses by 77.8% to 18.7%. Donald Trump came into the election cycle with the overwhelming advantage of an outsider. His campaign heeded the imperative to make the election a referendum on change. In a candidate-to-candidate context, Hillary Clinton would have won, albeit narrowly. In the referendum of the people versus the elites and change versus status quo, however, Trump narrowly won but should have won by a landslide. Only his own lack of discipline put the contest within reach of Clinton, the status quo candidate. It was not so much that Trump won and Clinton lost as it was a victory of change over incumbency. Voters were ready to move. Despite their own candidate’s negatives, the Trump campaign succeeded in moving those voters by clearly moving in their direction. Another lesson of the 2016 campaign was the refutation of the venerable philosophy of the late Speaker of the House, Tip O’Neill: “All politics is local.” In this election—and, undoubtedly, in elections going forward—“all politics is global.” While the media focused on the idiosyncrasies of the “battleground states,” it was the national narrative and national polls that were driving numbers in the states. An important part of the national themes and messages was about the people gaining control over their government. Trump’s relentless travel stops in so-called flyover country both addressed and emphasized this. Still, it was understanding a national yearning for change and control that drove the victory. But we said “global.” The truth is that the national yearning was actually international in scope. Most pollsters gave Trump almost no chance of winning in the US, just as almost nobody supposedly in the know thought Brexit would win in the UK, either. What does this mean for you and your business? Your organization may be laser-focused on some molecule-sized marketplace, but you must recognize how the big issues in people’s lives impact their perceptions and attitudes. In the digital age, your teammates, constituents, and employees can’t help absorbing the great themes from media and culture. Those mountains will affect the way they see the molehills. 3. Insurgents value vision over heritage. Incumbents look back at establishment norms and terms to develop their strategies and tactics. Insurgents like Trump are competing against the establishment and against the status quo. So, they look forward with a vision for the future when setting strategy. We don’t believe in ignoring history, but the worst mistake incumbents can make is to let the rearview mirror blind them to the roaring eighteen-wheeler headed toward them on the road ahead. 4. Insurgents hate bureaucracy and formality. Hillary Clinton broke with tradition by becoming the first female major party candidate for president. Yet even that momentous achievement failed to eclipse the dominant fact that the Clinton brand is the quintessential political establishment brand. The reality is that Hillary Clinton had essentially been running for president for thirty years. She had a traditional—that is, bloated—organization, which included twenty-five psychologists to analyze Trump’s behavior. (No kidding.) She also had nearly a billion dollars in paid advertising, a traditional Democratic ground game designed to push voters to the polls, and an enormous fund-raising apparatus that was needed to fuel all this. In contrast, the Trump campaign ran super lean, and the candidate himself lived up to his skinflint reputation, using his own branded assets as often as possible. Insurgents despise bureaucracy, because it dilutes the advantages of speed and mobility. Flatten it out in your organization or on your team. Speed controls the competitive dialogue. Speed wins. The next leader of your organization will be the “change candidate.” Bet on that. Better yet, be that. 6. Insurgents never play defense. One old political adage still applies: The candidate who controls the dialogue wins the election. Everyone now recognizes that Trump controlled the dialogue through his iconoclastic campaign. Even his petty, cringe-worthy, and salacious outbursts reinforced his authenticity as an outsider. Define yourself: If you don’t do it, the job will be done for you by others. (And you will not like what they do.) Remember, how you say you will decide is as important to “voters” as what you say you will decide. They are cynical about promises. (That’s why they crave change!) What they really want to know are the values and character behind the decisions you will make. Define the stakes in the election: Donald Trump had an uncanny feeling for Americans’ sense of loss of control over their government and their own well-being. This was clear in national research, in poll after poll after poll, as well. The establishment chose to ignore it. Look for the big themes. They are the big gears that drive the smaller ones. Look for connections of perceptions to attitudes to behavior. Look at your organization’s goals from the constituents’ point of view, not the leaders’. Define the enemy: Assuming you are the change candidate in your organization (and if this assumption is incorrect, you might as well stop reading right now), ask yourself—What is the enemy of change? (We said what, not Trump’s misadventures with personal attacks via Twitter prove how ineffective, even destructive, the ad hominin focus is.) In our experience with organizations of all sizes and shapes, we’ve found again and again that “the enemy is us.” The enemy is usually structural or attitudinal problems within your own institution. Define the future: People want and deserve to know where you intend to lead them. While Trump harped on “Make America Great Again,” he could have provided a Reaganesque view of that future and what it would mean to all Americans. Think in terms of your own team or organization, and ask your constituents some form of this question: “If we do everything right over the next months or years, what effect can we have on the world, on our company, on our markets, on each other?” Remember, people on any team want to be a part of something great. 7. Insurgents just do it. No matter your feelings about President-elect Donald J. Trump, you’ve got to admire his courage and conviction. Or at least, you should. To lead, you must choose to lead. You must decide. You must throw your hat (your money, your family, your career, your reputation, your personal safety and well-being) into the ring. Bloomberg didn’t. Biden didn’t. Romney didn’t. Susanna Martinez didn’t. Daniels didn’t. Brown didn’t. Trump did. And his money, family, career/brand, reputation, and personal security went on the line with that decision. As we ourselves said in The Leadership Campaign, it’s perfectly all right not to lead. Some folks even view leadership qualities as character flaws. But this doesn’t change the fact that leadership matters. In the Information Age, it may matter more than ever because relevant and different ideas trump (yes, trump) superior size and force. As imperfect as the Trump candidacy and campaign have been, we, like all Americans, hope it will lead to a successful presidency. Our nation needs that. Every organization needs leadership, and today it is insurgent leadership that not only wins the opportunity, but also shows the way to succeed once in office. As every American president learns, that first Tuesday after the first Monday in November is only the first contest. Leading means winning over and over and over again. Why not go back and give our seven principles a second read?